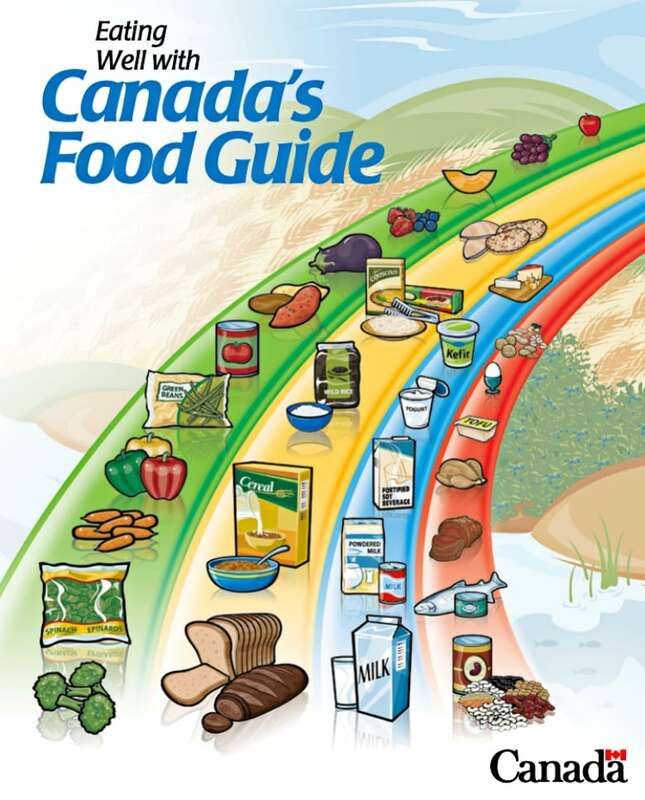 Canada's Food Guide has been given its first major overhaul since 2007. The update had been in the works for years, and was released this morning. Here's a look at how some of the other nearly 100 countries with food guides tackle the subject. 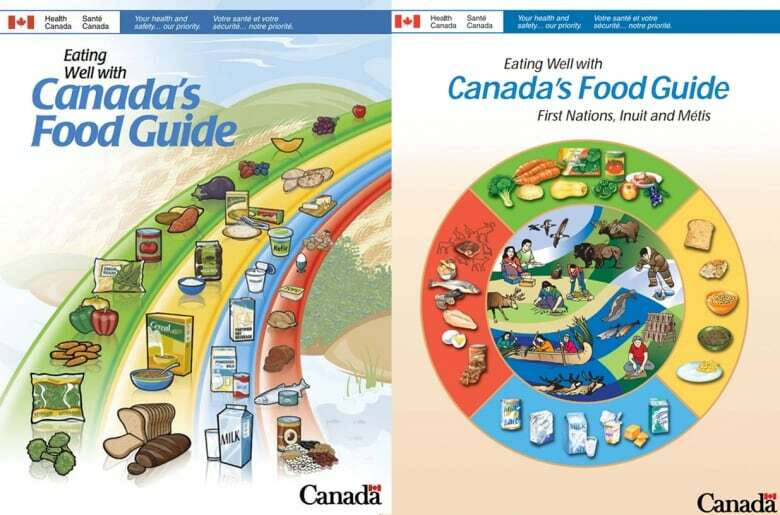 Canada's Food Guide has been given its first major overhaul in more than a decade. The update had been in the works for years, and released today in Montreal. While waiting for the release of Canada's new guide, we checked out the nearly 100 around the world from a list compiled by the UN Food and Agriculture Organization. Eat a variety of foods. And most tend to agree that eating more vegetables and whole grains is best, while consuming sugar and too much fat — especially processed fats — is to be avoided. But countries can get pretty creative when it comes to getting that information across. Cambodia's guide is in the shape of an Angkor Wat — a temple complex that's one of the largest religious monuments in the world. 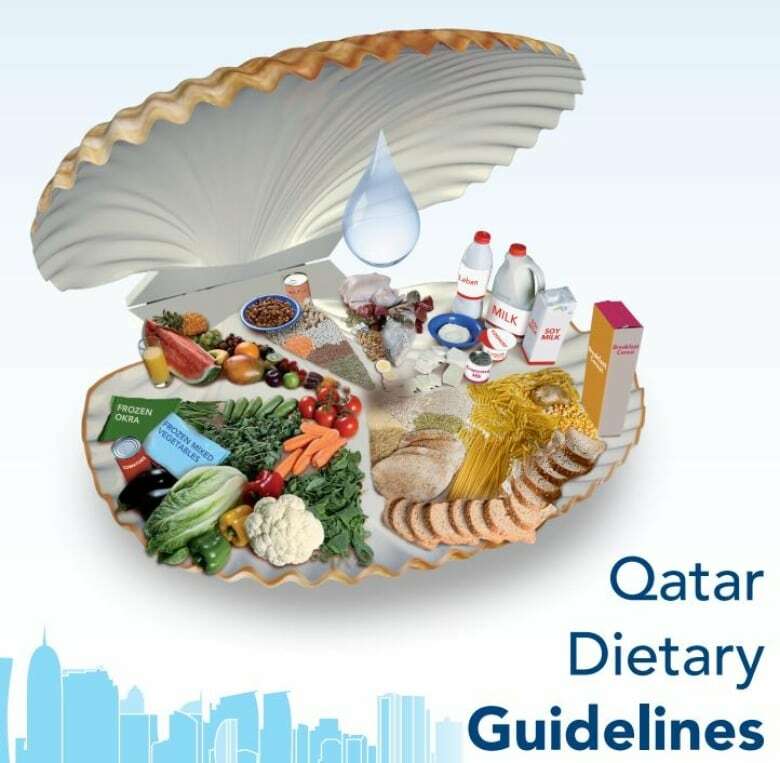 The guide was developed with the help of schoolchildren surveyed by the Ministry of Health about the foods they most commonly eat. Benin's guide is a round traditional house with a thatch roof. The water in the entrance is there for two reasons: as a symbol of Beninese hospitality and a reminder that plenty of water should be consumed throughout the day. 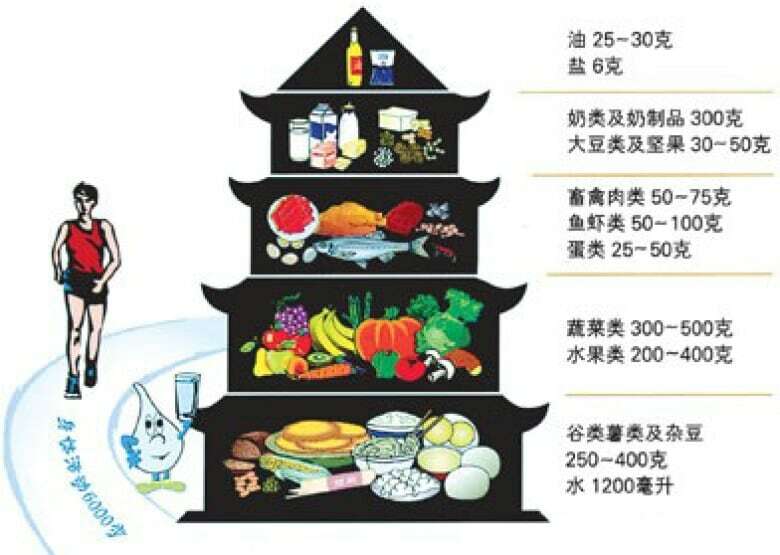 China's pagoda uses the traditional five levels to indicate how much of each food group should be eaten. 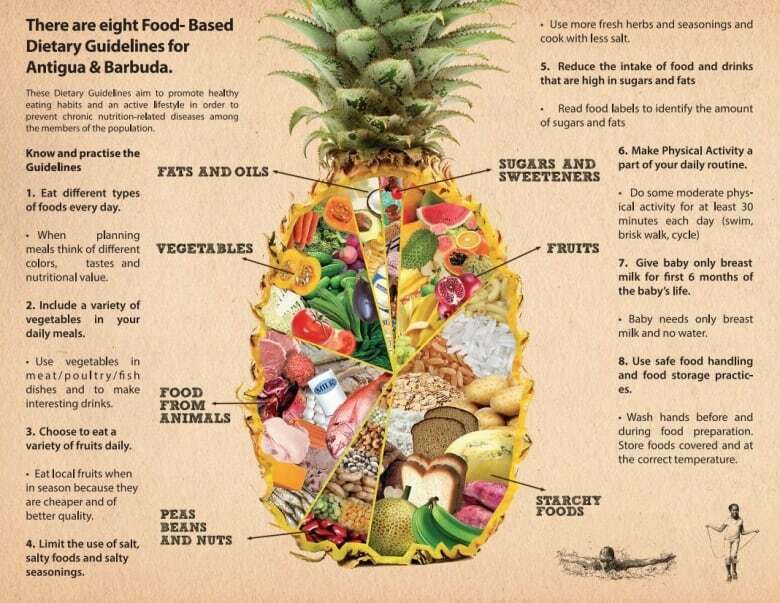 Antigua and Barbuda uses a pineapple, while Qatar's guide comes in the form of a seafood shell. In fact, only 12 make no mention of physical activity. Korea's is pretty obvious. 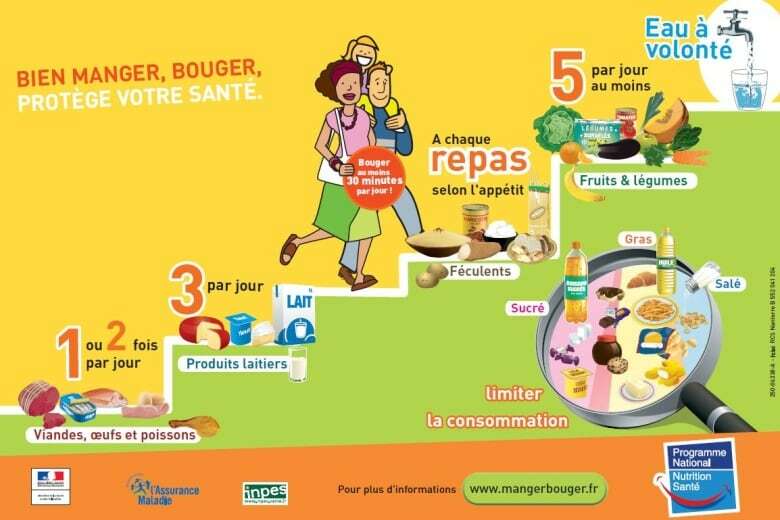 France has designed its guide as a staircase to hit home the message. 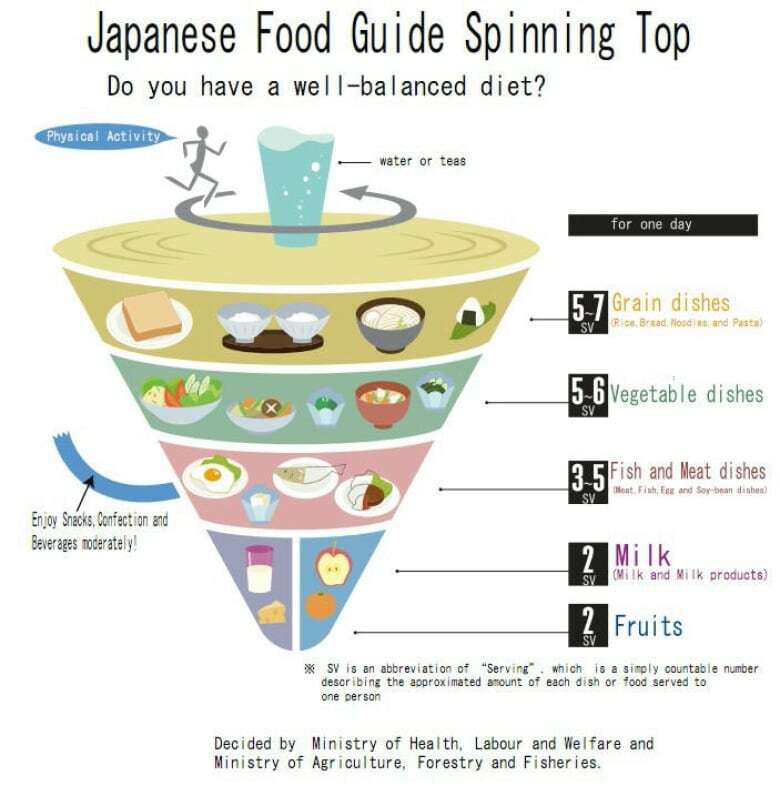 Japan's guide is in the shape of a spinning top — a traditional toy in the country. It features a person running around a glass of water or tea, to represent the need for adequate physical activity. And Canada is one of them. First published in 1942, Canada's current guide is available in English and French, as well as 10 other languages, including Chinese, Arabic and Punjabi. There is also a version designed specifically for Inuit, First Nations and Métis. 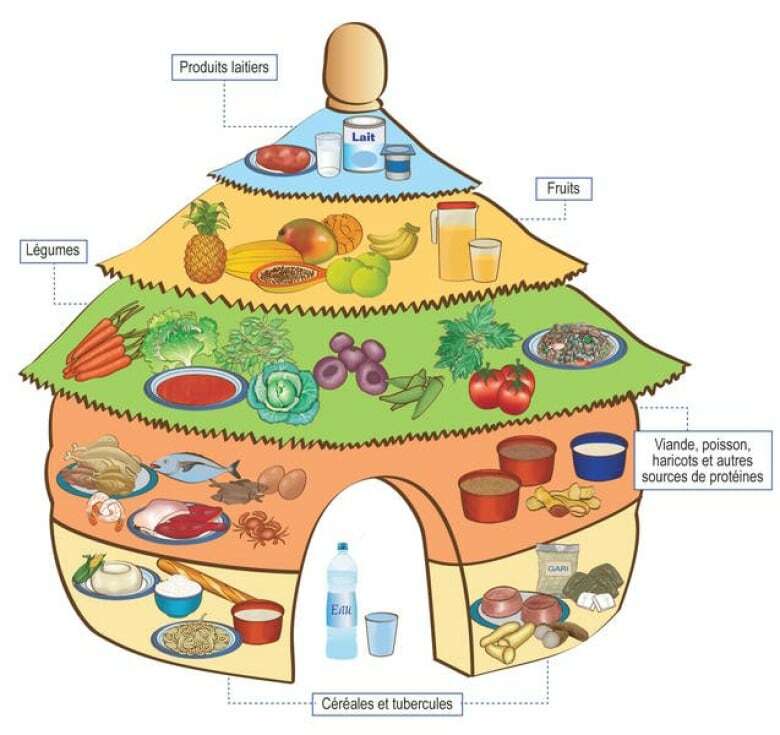 Venezuela also has two food guides: one for the general population and one for the country's Indigenous population. 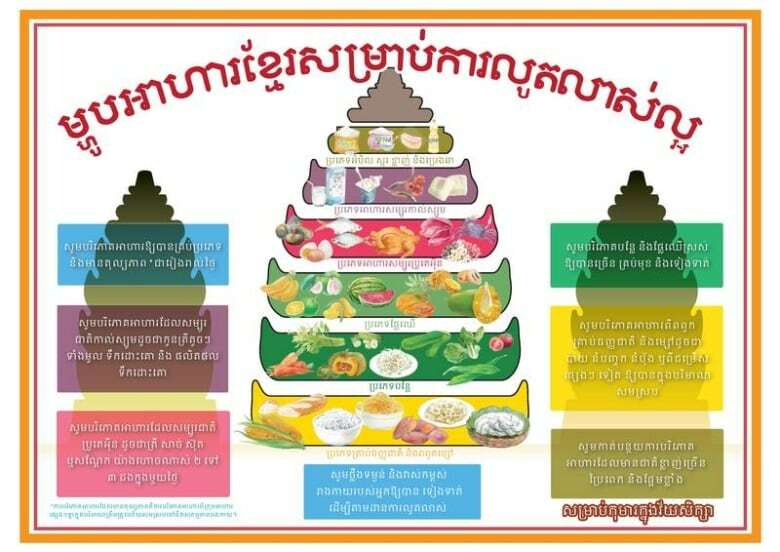 The main difference lies in the recommended protein sources, with a range of wild animals shown in the Indigenous one, and cuts of meat in the other. Belgium also has two guides, one for its French-speaking population and one for the Flemish. 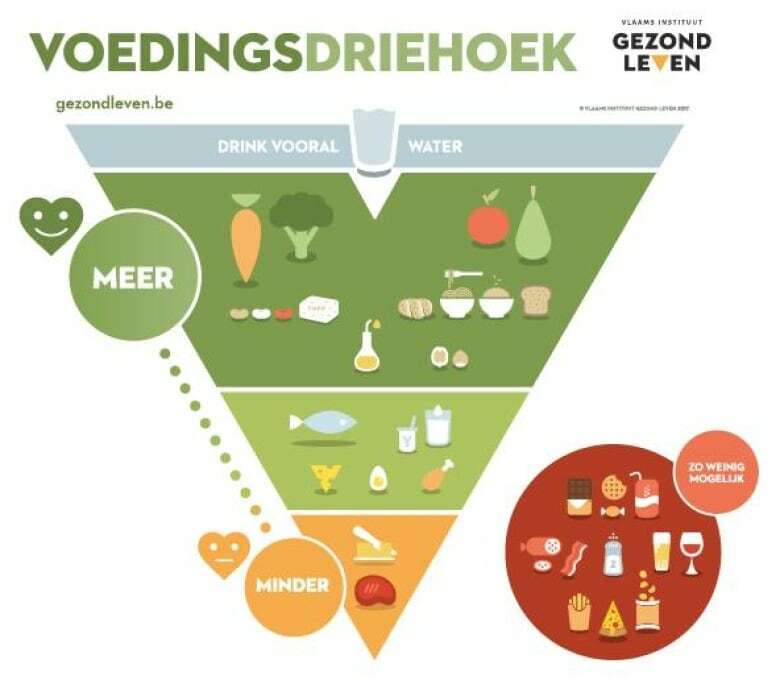 The Flemish food triangle focuses on foods that should be eaten often to occasionally. 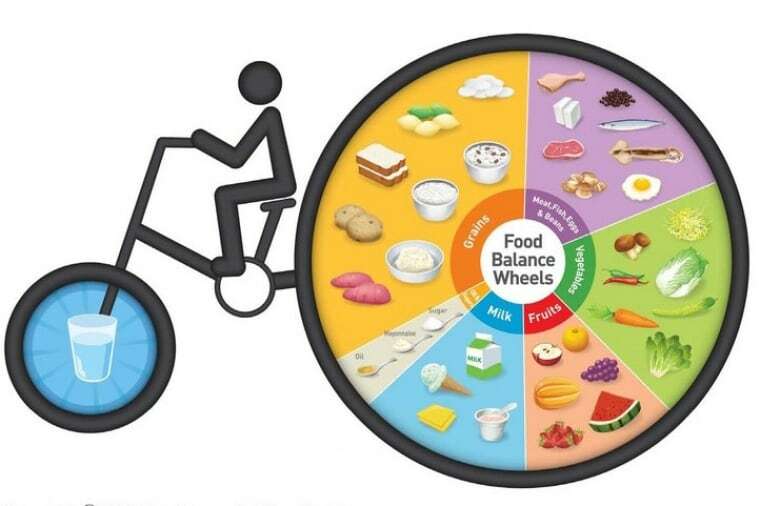 But what stands out is the red circle of foods beside it — foods it advises to eat as rarely as possible. It doesn't just feature the usual junk-food suspects, such as sugary candy, fried foods and alcohol. It also includes what many people would consider good protein sources: processed meats, such as cold cuts and bacon. Sweden's guide follows that esthetic made so famous by Swedes (think Ikea). 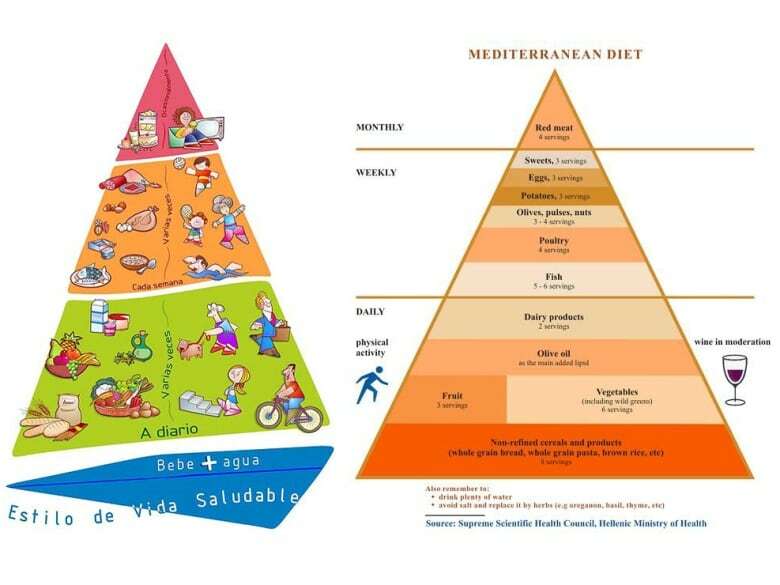 Spain and Greece divide their pyramids into daily, weekly and occasional consumption groups. 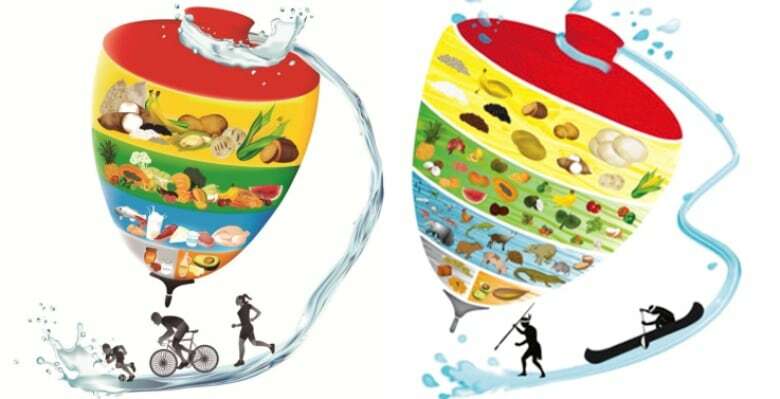 Brazil has been singled out by nutritionists and food scientists for its innovative approach. 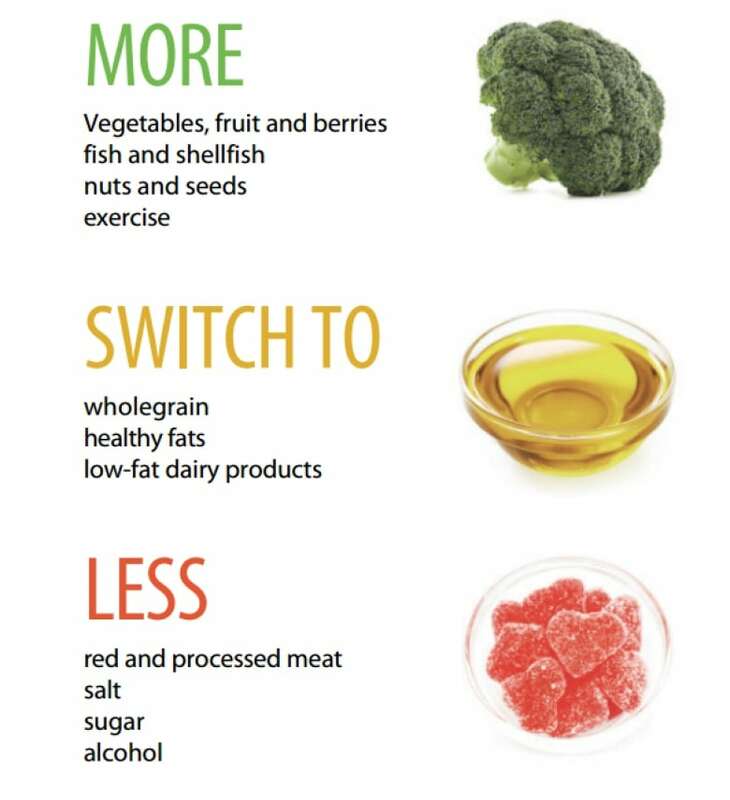 Instead of publishing a colourful picture of what you should eat more or less of, it has published guidelines on eating processed versus non-processed foods, and focuses on making choices based on social and environmental sustainability. And because the guide is long (152 pages) and not likely to be read by most Brazilians, the government has also helpfully narrowed it down into a short, 10-step plan.